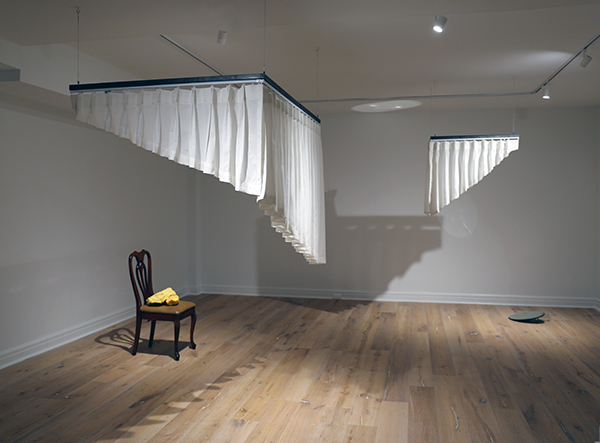 Curtain Room (2018) is composed of three separate pieces of curtain structure. This fragmented space is easily penetrated and invaded by people. In this space, it is difficult to distinguish between the inside and the outside. Curtain Room expands a certain aspect of capitalist space, particularly through the politics of space or power relation and structure in a society, which pervades space, place, territory and boundary. By looking at the space between expansion and displacement, between the visible and the invisible, and between dominance and fragility, this work focuses on the blurred boundaries between sharing, invasion and division in an urban space. In the changing condition of contemporary society, not only our everyday lives, but also existing orders and relations are easily changed, interrupted and invaded by people or by many other things. Drawing on this particular point, the work explores how a space is shared, changed and (de)territorialized in a particular spatial rule and order; a space can be a locus of material and conceptual transformation.